Generally speaking there are no enharmonic or inharmonic frequencies per se (excepting cases). As degree of harmonicity or enharmonicity is relative (relationship between two or more quantities) there are enharmonic relationships, ratios, chords or intervals. A shortcut (general rule of thumb) to determining enharmonicity as opposed to harmony is if the number is divisible by 2 (with no remainder) it is considered harmonic but on the natural scale. 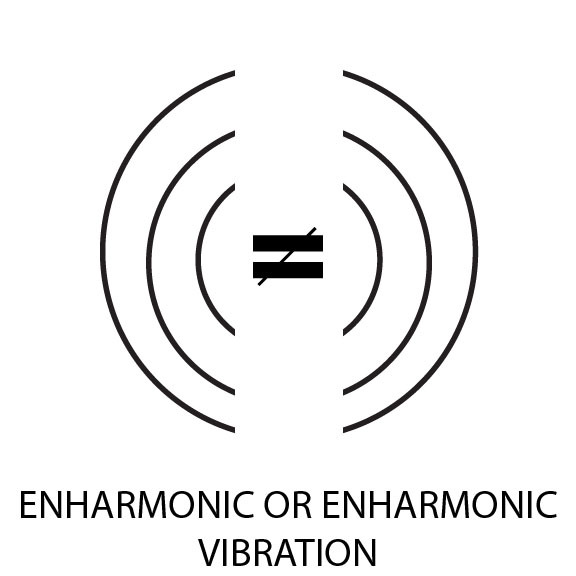 All other divisions are some degree of enharmonic in relation to the harmonic. ""in concord"; relating to that genus or scale employing quarter tones; comprising a major third and two quarter tones also the difference between three conjunct major thirds and an octave (ratio of 125:128); relating to the difference in pitch that results from the exact tuning of a diatonic scale and its transposition into another key. "In Greek music the enharmonic genus was the oldest of three ways of subdividing a tetrachord, the other two being the diatonic and the chromatic. In its original form it seems to have consisted simply of a major third with a semitone below, but in quite early times the semitone was divided into two quarter-tones, so that there were four notes in all, instead of three. "The existence of these small intervals, which were in use until Hellenistic times, is evidence of the close association between Greek music and Oriental music. "In modern acoustics the enharmonic diesis is the interval between an octave, i.e., 2/1; and the three major thirds, i.e., (5/4)3=125/64; B# is therefore flatter than C, and the interval is (2)/125/64=128/125.